CarMax is not only a voter favorite. 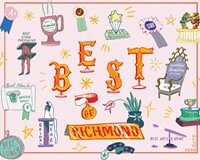 It’s a favorite among its employees and Wall Street analysts, who recently predicted the Richmond-born company will triple its market share in coming years. Fortune magazine has named it one of the “100 Best Companies to Work For” 11 years in a row, and local employees agree. The no-haggle, used-auto retailer has more than 145 stores nationwide, and, because it’s not all about buying and selling, but giving, its foundation has awarded more than $25 million in grants throughout the country. If CarMax is about buying, CarLotz is about the selling. Pay a flat $199 fee, or more for detailing, and CarLotz takes care of selling your car for you. If it sells, CarLotz takes $700 and the rest is yours. McGeorge Car Co. is family-owned, locally operated and sells used and new. And yes, there are plenty of price options. But one on the lot recently caught our eye — a sweet 2015 Mercedes CLA63 AMG S, starting at $106,550.